So, I mentioned my pledge to write 200,000 words in January with Get Your Words Out. I’m doing weekly word count updates on my writing blog, but here I’ll stick to monthly word counts. Get Your Words Out has a list of what counts. This is what I’m including (withing those guidelines). 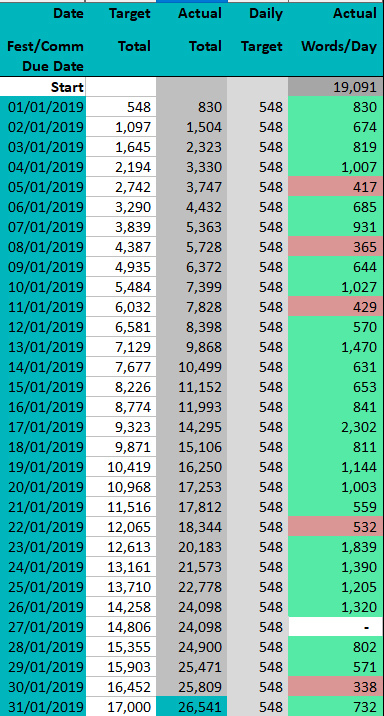 200,000 words a year works out at 548 a day, which isn’t that much and somewhere around 17,000 words a month and let me tell you, I hit that target on the 20th of the month. I am way ahead right now and it’s been really nice because it’s meant that I could take a day off here and there to do other things online and read or just not write when I’ve been feeling too depressed or too tired. I like writing though, I really do and it’s only the depression that’s ever held me back. I get Writer’s Apathy, rather than Writer’s block. During the week I write as soon as Snappy has gone to bed, because as you can see, toddlers aren’t always conducive to writing. Or anything productive really. At the weekend I tend not to write any more than I do during the week, there are other things to be done and a toddler to spend time with. I’m using an awesome spreadsheet to track everything that was made by Tryslora. I’ve tweaked the colours but it’s really good for seeing the numbers change and go up and allows for multiple projects. It colours it red and green depending on if you’ve hit your target for the say or not and as you can see a lot of it is green. I don’t know how long I’ll keep this pace up. I think if anything it will slow as the weather improves but either way, as soon as Snappy goes to bed I still have a lot of time to write before I go to bed. It’s just the way of the writer mum. So what have I written this month? Let’s have a look. I can’t believe I’ve written this much to be honest, it’s been a good month with only one day where I didn’t write anything because I was ill.